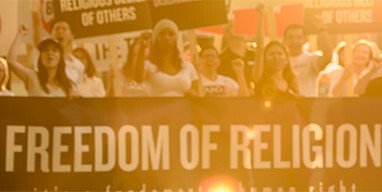 On Monday, July 30, at the Department of Justice’s Religious Liberty Summit, U.S. Attorney General Jeff Sessions announced the formation of a new Religious Liberty Task Force to defend the rights of citizens to freely practice their chosen faith. U.S. Attorney General Jeff Sessions, who has recently made religious freedom a Justice Department priority. He went on to describe how Pilgrims, Catholics, Quakers and Scottish Presbyterians sought and found refuge in early America. Mr. Sessions announced that the Task Force will serve to carry out the Department of Justice’s religious liberty guidance and will be co-chaired by Associate Attorney General Jesse Panuccio and Assistant Attorney General for the Office of Legal Policy Beth Williams. “We are very pleased that Mr. Sessions is taking measures to protect this nation’s people from religious discrimination and we are prepared to assist any such endeavor in any way we can,” said STAND’s International Director, Edward Parkin.